A robotic cell of roTeg consists of the four-axis robot as a central component. Furthermore many gripping solutions and the associated components for the packaging transport and roller conveyors for empty and full pallets as well as numerous sensory components are belonging to the system. 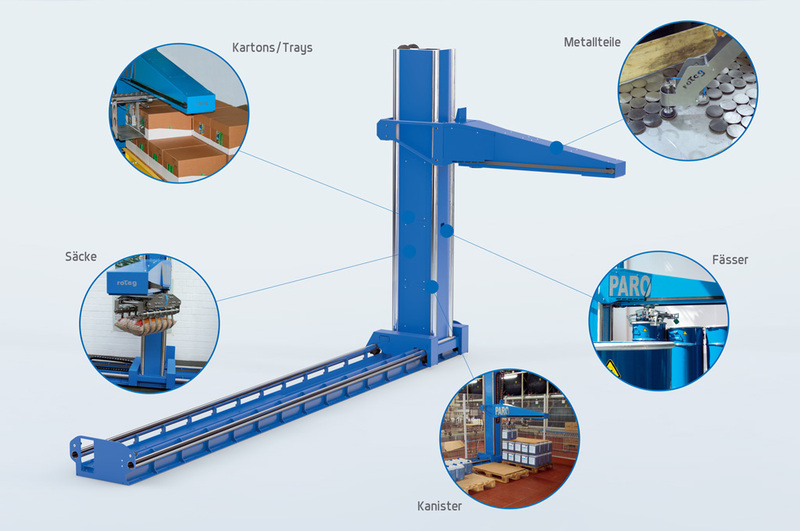 A multifunctional gripper on a standardized DIN flange is sufficient to palletising or depalletising cans, cartons, buckets, plastic containers or intermediate layers at the same time. Many gripping systems from roTeg are patented or protected by copyright. They grip it all: roTeg palletising robots and gripping-systems for flexible tasks. Environmentally friendly and safe to produce with the optimal use of all resources. roTeg has designed its compact robotic cell for a particularly efficient production. Rugged and simple designed, the de- and palletising can be used even in productions with very low ceiling height and limited space. Even different palletising heights can be easily realised. Especially practical is the freely designable gripping zone which allows multiple pallets to be placed in series. Each robot can be subsequently rebuilt or converted to ten or more pallet places or adjusted by extending the axle to the desired palletising height. Various lengths of the robot arm also allow to align pallets in lengthwise or transverse direction. In order to depalletise factory-new glass bottles the depalletising robots type I and II has been developed by roTeg. These three-axis robots are widely used in the food and pharmaceutical industries and are characterised by a similarly high degree of flexibility such as the roTeg palletizing.